We can't be the only ones who are wholly enjoying this unicorn Rennaisance. It's really something special, much like this exciting yet allusive beast. We've seen all sorts of products celebrating their mystic from delicious smelling and rainbow-colored bath bombs, gold accented unicorn tattoos, and let's not forget the somewhat controversial sweet, sprinkle-filled unicorn coffee drink. No matter how you felt about that sugar and the caffeine-fueled difference that was campaigned by a un-named global coffee shop, it's much more fun to be on board the unicorn wagon than off it. Our advice? Jump right on into the crystal clear pool of unicorn wonder with an out-of-this-world costume. What better way to make kaleidoscopic dreams come true? Now, we haven't verified that this unicorn mask makes dreams come true or heals the wounded but we have established that the mouth moves to speak as you speak. 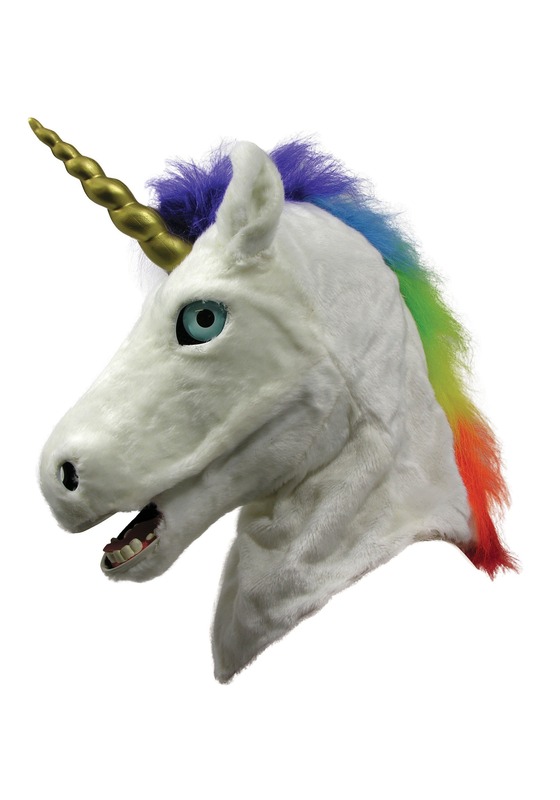 The mask has a soft fur-like finish, a rainbow mane that is the envy of all other beasts in the esoteric forest. It has baby blue eyes and wide nose openings for easy breathing and speaking. To top it all off, you'll look amazing when you show off your shining golden horn. When we think about the future, we should think about a future in which unicorns have a substantial foothold. This doesn't have to be a trend. After all, sweetness and light are always in style, right? Start the future outright. Trot into any party like you're walking on clouds. You can pair this mask with everything from rainbow robes to your regular black t-shirt and jeans. Because you're making the unicorn part of your day-to-day and thus you're doing what you need to do to launch the unicorn dream of today into tomorrow. It doesn't need to be a dream indeed, it can be a rainbow reality.